Steve Wilson, president of JKG group explained: "Daruma Tech’s attention to detail and highly professional support make them our application development partner of choice.” Daruma Tech has a long record of success creating custom conference and trade show software & apps for many industries. 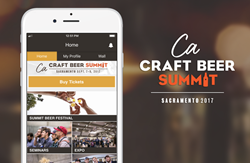 For the second year in a row, Boca-Raton-based software developer Daruma Tech has been tapped by the California Craft Brewers Association (CCBA) to deliver a mobile app for attendees to its signature industry trade show and conference (the CCBA’s “Summit”), held yearly in Sacramento. The mobile app will be supportive of one of the various Daruma Tech served industry verticals designed to meet the unique needs of associations, guilds, and event/festival organizers. The three-day conference and event is the west coast’s premier trade exhibition for the industry professionals served by the CCBA and features hands-on education, seminars, interactive exhibits, and networking opportunities. With the app, conference attendees will have an easy and convenient way to view a map of the conference site, locate exhibitors, explore the summit’s educational offerings, plan their schedules, and for fun, see and learn about the beer varieties available for tasting at the CCBA Festival immediately following the conference. Daruma Tech has a long record of success creating custom conference and trade show apps. Customers across a range of industries have praised their apps for increasing both visitor engagement and foot traffic at conferences. “Adopting new technology and methods can be stressful for any organization,” said Rick Griswold of Daruma Tech. “Our team handles every feature request, every deadline and every budget with professionalism and proficiency. The technical support we provide is the real power and value behind the success of the California Conference and Expo app. Daruma Tech’s software products are easily customized to support any conference, trade show or event - in any business vertical,” Griswold added. Daruma Tech (Brewers Marketing) is a privately held software design firm based in the FAU Research Park in Boca Raton, Florida. Its mission is to serve businesses across a range of industries with innovative software applications incorporating both cutting-edge technology and designs focused on the unique logistical and human needs of each client. For more information, contact Rick Griswold at 561-990-1625.